Karren LaLonde Alenier is a poet drawn to Gertrude Stein's work through her interest in experimental writng and music. In 1982, Karren worked with Paul Bowles on several of the Stein poems associated with the opera libretto Gertrude Stein Invents A Jump Early On. The mother of a grown son, Karren Alenier lives with her husband Jim Rich in Bethesda, Maryland. Karren grew up in a family actively interested in music. Her father was a drummer in a dance band. Her brother Jay plays ornamented jazz on the piano in the style of Art Tatem. Her sister Nancy, starting with a quarter-sized violin, was the darling of one of the concert masters of the National Symphony Orchestra. Youngest sister Lisa pursued dance--tap, ballet, jazz, and middle Eastern forms--both performing and teaching. Karren's poetry characteristically is lyrical. The words selected play to the ear showing her interest in language, both in sound and meaning. Holding a bachelor of arts from the University of Maryland, College Park, Karren majored in French literature and language with a heavy minor in American and English literature. 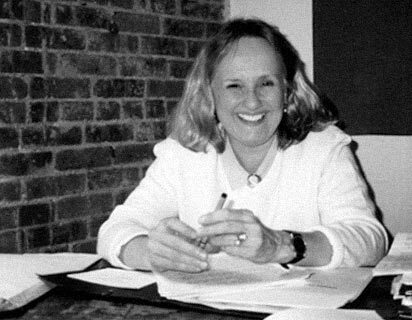 Although she began writing when she was in grammar school, serious work developed after she left college and started meeting with a circle of peers that included the now screenplay writer Deirdra Baldwin, the antique piano restoration expert Paul Revenko-Jones, and physicist Jim Beall. In 1982 through a program sponsored by New York's School of Visual Arts, Karren spent three weeks studying with writer/composer Paul Bowles in Tangier, Morocco. Although she intended to work with him on her first novel, she and Bowles worked instead on her poetry about Gertrude Stein. Bowles was particularly helpful in working out the kinks in the rhythmic language poem "Leo on Seesaw." Although apologetic about his own poetry and admitting that Gertrude Stein was right in telling him not to write poetry, Bowles had a finely tuned ear for the kind of poetry in Karren's work-in-progress collection. 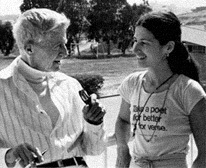 Karren with Paul Bowles in Tangier, c.1982. 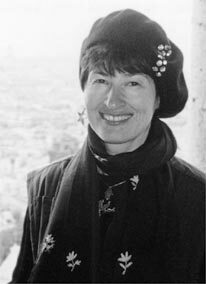 In 1995, Karren traveled to Prague to work with James Ragan on what would become her fourth collection of poetry, later titled Looking For Divine Transportation. This collection, awarded the 2002 Towson University Prize for Literature, contains her poems about Gertrude Stein, her travels in Morocco, her eccentric family, and her own brand of Eden. In 1996, her third collection of poems Bumper Cars: Gertrude Said She Took Him For A Ride was published by Mica Press of Ft. Collins, Colorado. This chapbook contained a selection of her Stein poems and an early draft of Act I of Gertrude Stein Invents A Jump Early On. Karren delivered the first publication reading in the Motor City of Detroit in the Writer's Voice Series during one of the last poetry programs at the old YMCA before it was demolished. Since the late Seventies, Karren has been developing the body of work that has become Gertrude Stein Invents A Jump Early On. The path of creation is not linear. It was not until February 3, 1996, on the anniversary of Gertrude Stein's birth that Karren and 12 other poets spoke the lines contained in this then one act tableau vivant verse play. Despite two feet of newly fallen snow, fifty people gathered at Chapters, Washington, DC's mid-town literary bookstore for this reading. The consensus was so far so good but where's the rest of it? Based on an invitation to read the Stein work at Washington, DC's Grace Church in Georgetown, Karren set her sights on writing two more acts for the Georgetown program scheduled for April 8, 1997. Act II was written in one week in Florence, Italy. Karren was in Italy that fall to initiate the first Word Works Writers Retreat in the Tuscan countryside. Overly optimistic, she planned to write acts II and III in the week preceeding the retreat. Act III, set at the end of World War II was written in the winter of 1997 and required extensive research. By the time Act III was written, Karren understood the play's potential for opera. She began contacting people in the arts to gather a list of new music composers. Specifically she was interested in a composer who had a penchant for jazz. 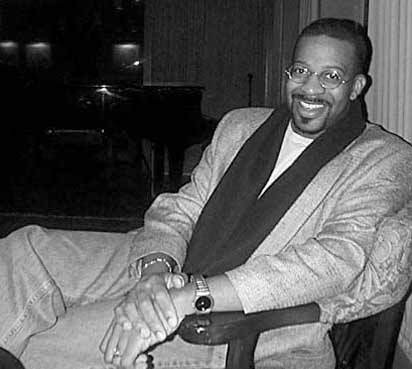 The first composer Karren worked with was Jeffrey Mumford who was recommended to her by the Dean of Music at Howard University. Jeffrey read the verse play and suggested that Karren listen to Schonberg's Pierot Lunaire and Stravinsky's Les Noces. In both of these compositions, recitative predominates. With short lines the norm in the original verse play, the musical approach indicated recitative. Certainly recitative dominates The Mother of Us All, the second opera Gertrude Stein and Virgil Thomson collaborated on and which was one of Karren's major source of inspiration. Not having any experience marketing such a project, Karren began calling opera organizations looking for a strategy to gain a commission for this project with a big opera company. After a year of meetings in which both composer and poet brain-stormed without success on how to kickstart financial support for the project, Jeffrey and Karren agreed it was best to move in separate directions. Serendipitously, The Word Works awarded its 1998 Washington Prize to Nathalie Anderson, a poet whose libretto, based on a novel by Thomas Mann, was featured in a new music opera (The Black Swan with music by Thomas Whitman) that was premiering that fall under the direction of Sarah Caldwell. Starting with a referral from Nat Anderson, Karren called back and forth across the country getting a string of referrals that lead to William Banfield. Based on a simple strategy that Bill suggested in that short first phone call, Karren made several phone calls and got the attention of Nancy Rhodes at Encompass Music Theatre (now known as Encompass New Opera Theatre). Active in the American literary community, Karren has developed and managed literary programs that promote poetry. She has been involved in organizations and programs at the Folger Shakespeare Library and the Library of Congress. Since her first book of poetry was published in 1975, she has had an active role in The Word Works. Her poetry and fiction has been published in hundreds of English language journals and literary publications. She was the recipient of the First Billee Murray Denny Award. She has been a fellow numerous times at the Virginia Center for the Creative Arts. Since 1978, she is listed in the Directory of American Poets and Writers. by Karren LaLonde Alenier, Francine Geraci, and Ken Pottiger, Tangier, 1984, published in Conversations With Paul Bowles, edited by Gena Dagel Caponi, University Press of Mississippi, Jackson, 1993. This interview was first published by Gargoyle magazine, spring, 1984. While some admirers of William C. Banfield may call him a Renaissance Man, his multidisciplinary accomplishments and abilities map him squarely in the third millennium. As professor, composer, musician, director, and author, he is a man charting new territory in current times, times that demand fluency in a much bigger world than the Renaissance Man knew. Born and raised in Detroit, Bill says his house was filled with the sounds of Beethoven, Ellington, Pavarotti, and Al Green. Symphony concerts and a progressive church offering both classical greats as Beethoven and Bach and traditional gospel songs were part of his landscape growing up. He earned a Bachelor of Music from the New England Conservatory of Music in 1983, a Master of Theological Studies from Boston University in 1987, and Doctor of Musical Arts from the University of Michigan in 1992. His diverse blend of musical influences were shaped by his teachers and mentors including T.J. Anderson, George Russell, Leslie Bassett, William Bolcolm, and William Albright. In 2000, he is a W.E.B. Dubois fellow at Harvard University where he will be working on two operas, including Gertrude Stein Invents A Jump Early On. Bill is professor of Africa, Music and Society studies at Berklee School of Music, Boston, MA. He served previously as the Endowed Chair in Humanities and Arts at the University of St. Thomas in St. Paul, Minnesota. Bill is the founder of the Bmagic Orchestra that has been playing contemporary hip arrangements of jazz, hip hop, soul, and popular music throughout the Twin Cities in club, malls and college venues. The Bmagic Orchestra has recorded or performed with such artists as Patrice Rushen, Bobby McFerrin, Billy Childs, Don Byron, the Philip Brunelle Ensemble Singers, Sounds of Blackness, Mark Ledford, and Nelson Rangell. Bill has composed eight symphonies, six symphonic concertos, four operas, music for ballet, musicals, chorus, chamber ensembles, jazz ensembles, and song cycles for voice and keyboard. In February 2000, his new piano concerto No Mirrors in My Nana's House was given its second performance at the Kaye Playhouse in New York City. (It premiered in January with the Grand Rapids Symphony featuring pianist Patrice Rushen.) Based on Ysaye Barnwell's story about an African American girl growing up in a house without mirrors, Bill expands the scope of the Barnwell's work, concentrating on the power of inner reflection and outer influences, particularly prejudice. Of the music, The New York Times stated that the piece "posed an interesting experiment in perception: the opening bars had harmonizations that could be heard as typically jazz or as typically Bartokian." In March 2000, Luyala, an opera ballet premiered at Duke University. For this, his fourth opera, Bill received his commission from the Lila Wallace-Readers Digest Fund. Luyala is based on an African folk tale and incorporates gospel music. Featured in this production was jazz star Nenna Freelon. Bill's Landscapes in Color: Perspectives, Conversations and Visions of Black America Composers was published by University Press of American/Scarecrow Press. Related to this forthcoming book, National Public Radio has broadcast several two hour shows hosted by Bill entitled 'Landscapes in Color: Concerts and Conversations with Black American Composers." Recordings of William Banfield's music can be found on TelArc International, Atlantic, Innova, and Albany Records labels. He is published by MMB Music, St. Louis. Visit http://www.billbanfield.com/ for more information. Nancy Rhodes is the founder and artistic director of Encompass New Opera Theatre formerly called Encompass Music Theatre. The first production of Encompass Music Theatre was The Mother of Us All by Virgil Thomson and Gertrude Stein. Nancy directed this production. For Nancy Rhodes, this was a second experience in directing this work. She had first directed a workshop production of The Mother of Us All at C.W. Post College and during that production had made friends with Virgil Thomson. Thomson later became one of the founding advisory board members of Encompass. Among Nancy's many accomplishments in prestigious venues are the staging of the world premiere of Tartuffe for the San Francisco Opera, staging of Virgil Thomsonís opera Lord Byron at Alice Tully Hall, and staging of new musicals for the O'Neill Theater Center, BAM, and Pittsburgh Opera Theatre. Also she has worked internationally on Britten's Death In Venice (Stockholm), The Holland Festival (Amsterdam), Weill/Brecht's Happy End (Finland), Carmen (Oslo), Kiss Me Kate (Ankara-filmed for Turkish TV), and West Side Story (Istanbul, for the State Theatre of Turkey). In 2002, Encompass presented the New York premiere of Grigori FridÕs The Diary of Anne Frank, which will commence touring in 2004 at the Cleveland Opera. She teaches musical theater workshops in Europe and is the Vice President and U.S. Delegate to the International Theatre Institute, Music Theatre Committee where she has been a panelist and guest speaker in Sweden, Germany, Venezuela, Korea, Moscow, Czech Republic, Estonia, and Istanbul. A graduate of New York University, Tisch, she taught Acting for Singers at Manhattan School of Music for twelve years, and currently teaches Oral Communication, Play Production, and Voice and Articulation at Mercy College. Nancy was born in Chambersburg, Pennsylvania. Taking environmental issues seriously, she enjoys camping and the great outdoors. She has a finely honed sense of the absurd, shies away from work that is academic, and embraces life with gusto.